To me, the perfect roast potato has a thick, golden, super crunchy crust, it is fluffy and moist on the inside and perfectly seasoned. How many times have you gone to the effort of making a spectacular roast dinner, only to be let down by less than perfect roast potatoes? 4) the oil used is a high smoke point oil (peanut, safflower, rice bran, sunflower oil)- the hotter the oil when the potatoes go in, the better the crust. Above all else, the 3rd and 4th points are the key. It makes all the difference and doesn’t take any extra time because the oil is heated in the pan while the oven is preheating. If you don’t have time to par boil, then cut the potatoes up smaller and dust with semolina (but it doesn’t stay on well as when you do this after par boiling), use the preheated hot oil method and you’ll notice the potatoes are a lot crunchier. 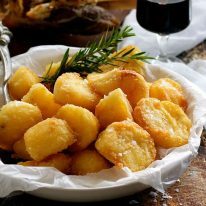 This recipe for roast potatoes came after I watched Nigella on a Christmas Special a number of years ago making her perfect roast potatoes. It changed the way I made potatoes forever, and I have never looked back. Nigella’s recipe is rather indulgent. It is made using goose fat – A LOT of it, around 2 cups (640g/1 1/4lb). I remember reading in the news that the first year her Christmas Special aired, goose fat sold out all over the UK!! We didn’t have that problem here in Australia because goose fat is expensive – it’s around $15 to $20 per can and you need TWO of them. So basically, making Nigella’s roast potatoes would cost close to $40! 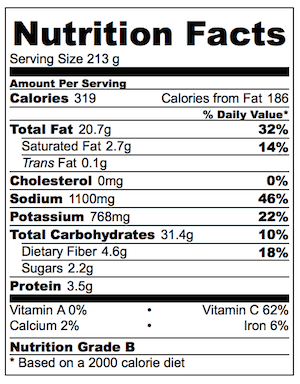 Duck fat is the closest substitute, but it is expensive as well, around $12 to $15 per can. I have made this with both goose fat and duck fat, and it is sensational. 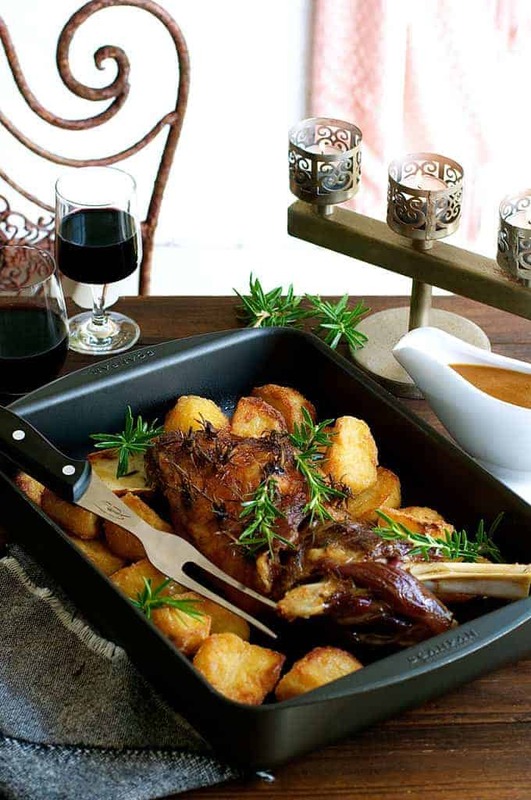 I used fat rendered from roasting goose and duck, not store bought fat – I don’t think I could ever justify such a cost, not even for potatoes! There is a distinct flavour using goose or duck fat that can’t be replaced with any bottled oil. BUT you can still achieve the same level of crunchiness, using the same method as Nigella does but with specific types of cooking oils instead of goose fat. And using a lot LESS oil too. I call this Perfect Roast Potatoes for Normal People. 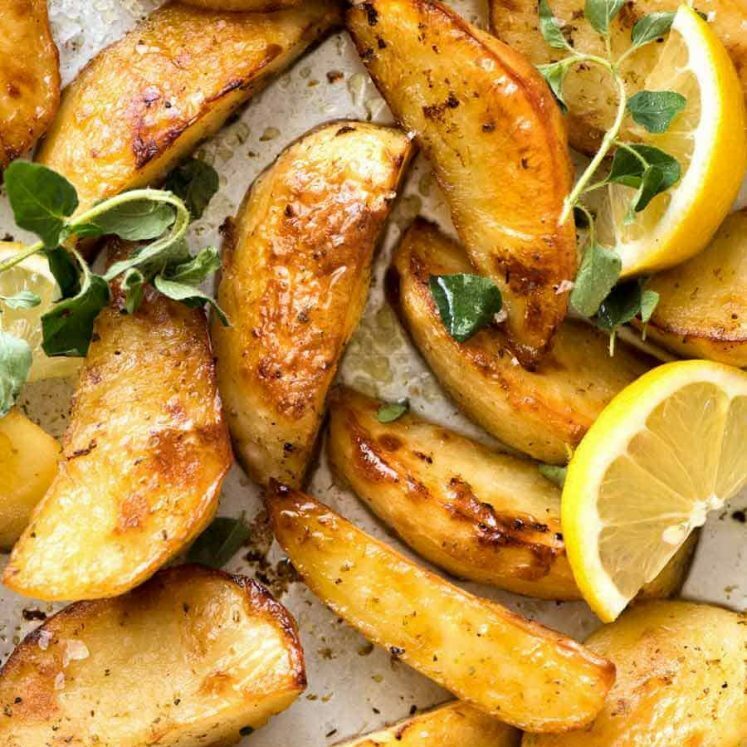 Nigella’s Perfect Roast Potatoes is for wealthy people who can afford $40 roast potatoes! (Or if you live in the UK, where goose fat is MUCH cheaper!). I’ve provided directions for Nigella’s recipe in the notes. Just in case you are one of “those” people! I made these roast potatoes to go with a Slow Roasted Rosemary Garlic Lamb Shoulder. You can’t bake them at the same time because of the different oven temperatures required, but lamb shoulder can be set aside to rest for up to a couple of hours before having to reheat it. So the timing works very well! Oh, the other thing worth noting is that the potatoes will be crunchy when they are a golden colour with only a few bits of dark brown parts. Standard roast potato recipes are typically darker brown. 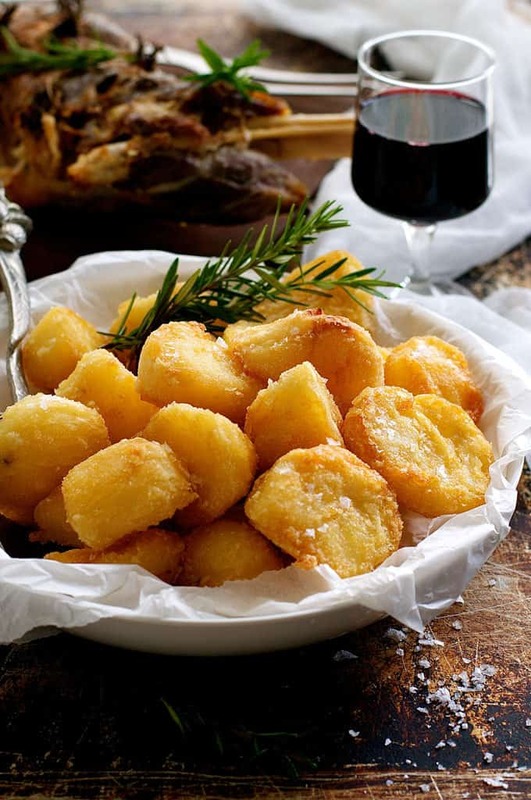 Roast potatoes that have a thick, crunchy crust and are soft and fluffy on the inside. Based on a Nigella Lawson recipe, except she uses goose fat instead of cooking oil. Directions for her recipe are included in the notes. You can cut down on the fat if you want, but the less the oil, the thinner the crunchy crust and the less crunchy it will be. I do not recommend reducing it less than 1/3 cup. These potatoes are the perfect accompaniment to the Slow Roasted Rosemary Garlic Lamb Shoulder and can be made while the lamb is resting. Pour the oil in a metal or cast iron baking dish and place in the oven. Crank up your oven to as high as it will go (mine is 250C/480F fan forced). Boil the potatoes for 10 minutes. Drain then return to the pot. Scatter over the semolina and salt. Clamp the lid on and give the pot 5 good shakes to rough up the potatoes. Leave the lid on and set aside. The oil should be hot enough by the time the oven comes to temperature. Test it by tossing in a pinch of potato - it should sizzle straight away. Pour the potatoes in (be careful of oil splashing). Working quickly, use an egg flip to toss the potatoes in the oil, spread them out as best you can then put the pan to the oven. Serve immediately! They will stay crunchy for around 30 minutes, but the faster you get them on the table, the better! They also crisp up pretty well when reheated - reheat @220C/425F for around 15 minutes (from room temp, add 5 min from fridge). 1. One of the reasons that Nigella's recipe works is because the smoke point of duck and goose fat is so high. Coating the potatoes in the hot oil when they go into the oven helps immensely in creating a crunchy crust. The hotter the oil, the better the crust. The oils I have listed have high smoke points i.e. they can be heated to a high temperature in the oven without smoking. 2. Perfect roast potatoes start with the right potato. It has to be a potato with a high starch content so it will bake with a fluffy inside and will soak up the oil to form a crusty exterior. Australia - the common dirt brushed potatoes (Sebago) work great with this, it's a great all rounder. Otherwise, any of these are great all rounder potatoes for this: Desiree, Golden Delight, Kennebec, King Edwards, Pontiac, Red Rascal, Royal Blue, Spunta. US - russet is ideal. Yukon Gold is not suitable. UK - Maris Piper is a good all rounder which is suitable and readily available in all the supermarkets. King Edwards and Desiree are also great. 3. This might seem like alot of salt but you lose some of it in the roughing up. 4. Size matters. If the potato is too small, they will overcook before the outside becomes crunchy. 5. The roasting time depends on the strength of your oven, oil, how much you preheated the oil, and how heavy based the roasting pan is. 6. These potatoes do not roast to a dark golden brown that you may be used to with ordinary roast potatoes. They will be crunchy when they are a golden brown colour with only some browned edges. 7. Nigella's recipe has the same steps except she uses goose fat instead of normal oil. Her recipe calls for 1lb 5oz / 640g of goose fat which is 2 cans. Also she uses 5lb/2.5kg of potatoes which doesn't fit into any of my pans so I reduced the amount of potatoes. I wonder if ghee would work?? Amazing…not enough unch in crunch to describe these bad babies. OMG! These potatoes are the BOMB! My husband is already thinking of other main dishes to pair these with! I didn’t have seminola, so I used fine polenta/corn meal. Absolutely delicious! Another winner winner, side dish dinner winner! Served this to friends along with your slow cooker pork loin roast. Everyone raved about it. I think you’ll have a few more followers joining in the next couple of days. Thinking of you and Dozer playing in the sun while we’re freezing in Saskatoon, Saskatchewan, Canada (it’s -23 centigrade here right now) – perfect weather for comfort food! Wow that is freezing!!! A roast is perfect in that weather, I’m so glad it was a hit! Thanks Nagi! My potatoes never crisp up enough! Can’t wait to try these. We are serving tenderloin and seafood for Christmas!! Do you think you could prepare these the night before up to the boiling and drain then bake them on Christmas day? Or even just cutting the potatoes night before, ready to boil next day? Sometimes the peeled potato goes a funny colour. Oh great tip! I’ll have to try that next batch! As luck would have it, there is a home-raised goose waiting to be roasted this weekend, so now I know what I’ll be doing with the leftover fat! I’m not sure if you’re aware of this, but it seems that we here in the USA are about to be subjected to GMO Russet potatoes, and (of course) they won’t be labeled as such. So until next year when I can grow my own again, I won’t be buying any Russets. Any others you can suggest? Thank you as always Nagi, and I second a comment made previously – all of your recipes come out perfectly! Hi. Making these potatoes for a gluten free friend. 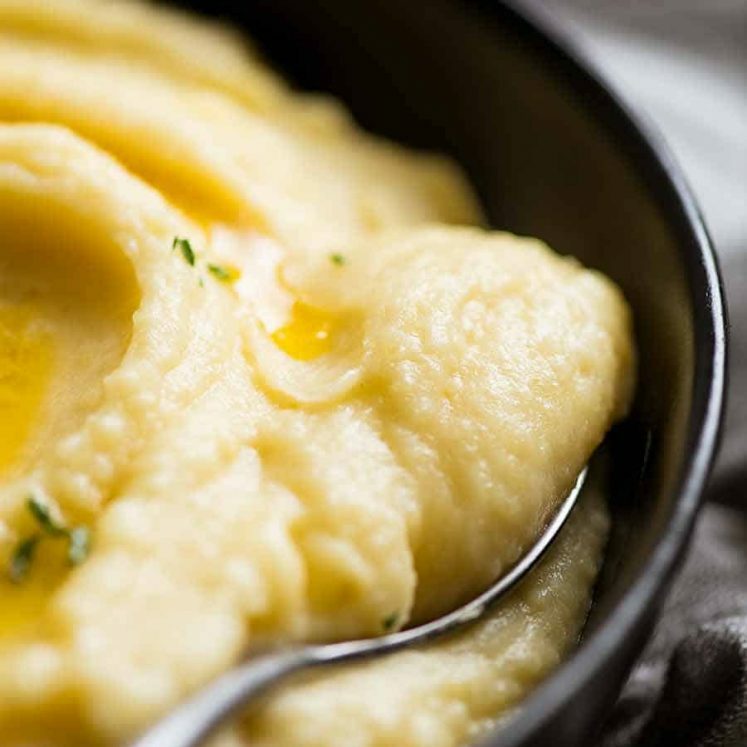 When you say polenta you mean corn, correct? Thanks. OMG Nagi! You have surpassed yourself AGAIN with your potato recipes, firstly I thought the smashed potatoes were the Ants Pants then the Greek Roast Potatoes won me over, last night I made the Crunchy Roast Potatoes done with the semolina, they were to die for! 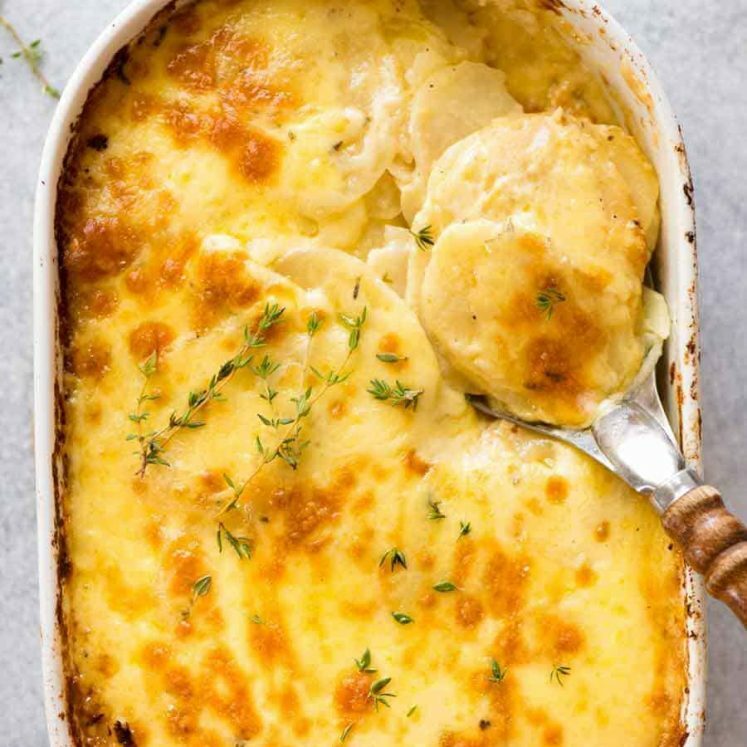 Thank you soooo much for giving us a different spin on potatoes. Big hugs to Dozer, love the photos of him. I cannot express how happy I am to have found this recipe. I have been trying to re-create my grandmother’s roast potatoes for more than 15 years. Tonight, with this recipe, I did it! I am just thrilled! I have sent the recipe to my parents, my sisters, my cousins. We all talk about the family roast potatoes from our childhood, and now I can make them! These are amazing, the best potatoes that I have ever had! I always make 2kg worth and there are never any leftovers 🙁 I usually add some thyme or rosemary before I put them in the oil. I am always a big critic of my own food, apart from when I make your recipes. Thank you for another winner Nagi! The potato’s look awesome! I can’t wait to try your recipe. This is not one of the oil’s that you said “must” be used, but will avocado oil Be OK to use. I know it has a high smoke point. Have made these truly, truly crunchy spuds so many times & every time without fail, they just deliver. Every recipe of yours just work Every Time. Most other recipes sort of work but rarely live up to the expectations that you have in your mind & so result in a little disappointment. I still look at others but in the end l just come back & everyone l have cooked for are always happy & take home your recipe. Thanks Nagi. Loving your food. Just the best and most crunchy roast potatoes I’ve ever made. So easy roughing them up by bouncing around in the pot with the semolina – instead of my usual of using a fork which is time consuming, as well as ending up with burnt fingers. I used rice bran oil which is supposed to be one of the healthier oils. Thank you Nagi – made with your other 2 receips of Slow roasted shoulder of lamb and Creamy parmeson broccoli recipe – but instead used cauliflower. Pure heaven. 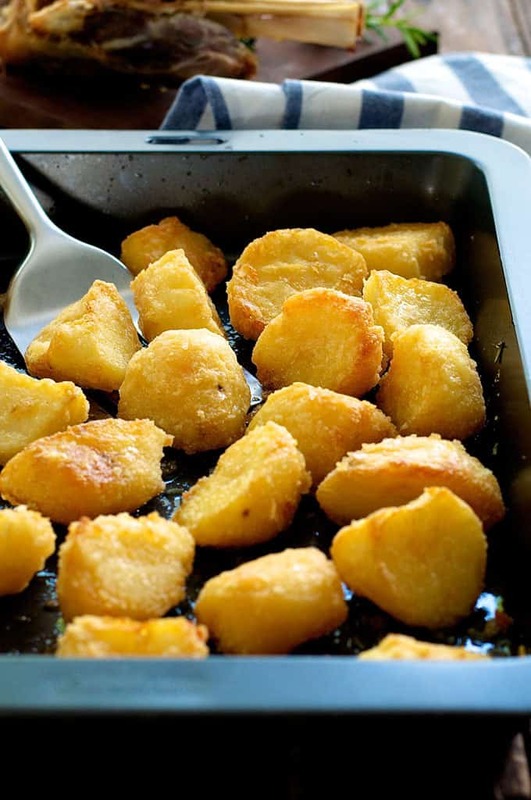 Oh my goodness – just the best and most crunchy roast potatoes I’ve ever made. So easy roughing them up by bouncing around in the pot with the semolina – instead of my usual of using a fork which is time consuming, as well as ending up with burnt fingers. I used rice bran oil which is supposed to be one of the healthier oils. Thank you Nagi – made with your other 2 receips of Slow roasted shoulder of lamb and Creamy parmeson broccoli recipe – but instead used cauliflower. Pure heaven.